Sixty-one years old, Ray Houghton is a fitness fanatic since he was a boy. He is now a celebrity personal trainer who is known for his transformation of the body inside-out. Houghton spent over 9,500 USD and more than 240 hours on a Full Bodysuit Tattoo. His skin is now fully covered under ink from head to toe. Let’s explore his Full Body Tattoo Suit. Meaning: Houghton inked his first name Ray on his right wrist. This is one of the eight embarrassing tattoos that he got inked during his days in the army. He got this inked by that tattoo artist, Sailor Bill. He joined a Royal Artillery during his teenage and got the tattoo inked in a caravan near the base camp. This tattoo is now covered under his new body tattoo suit. Meaning: Ray has tattooed the portrait of geisha (now covered under new tattoos) on his right forearm during his days in the Royal Artillery from the Tattoo Artist, Sailor Bill. The Geisha is Japanese women who entertain by performing the ancient tradition of art, dance and singing. Meaning: Ray has got this tattoo during his army days from the Tattooist, Sailor Bill, which he doesn’t find spectacular along with other eight embarrassing tattoos. This ink is now covered again under his new inks. 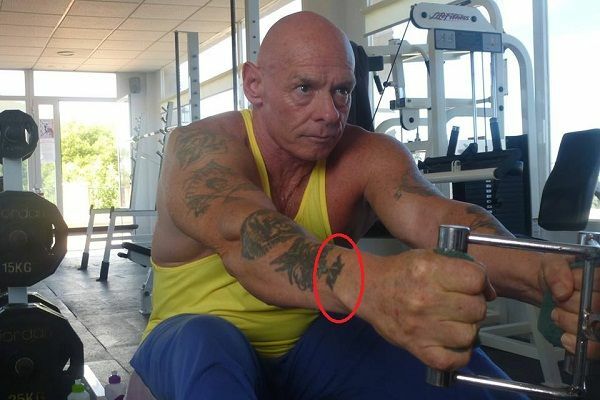 Meaning: Ray got an undefined or indistinct tattoo on his upper right arm again by the Tattooist, Sailor Bill, when he was in Royal Artillery. This tattoo is now covered under his new inks. 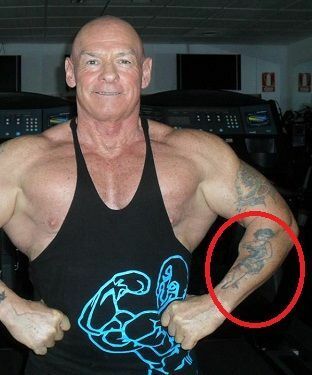 Meaning: Ray has got an undefined pattern of the tattoo on his left upper arm which has a face inside it. This tattoo is inked by the Artist, Sailor Bill, which is also covered under his black body suit. 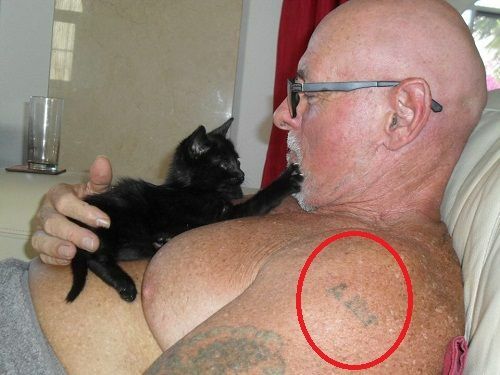 Meaning: Ray has inked his left shoulders with some alphabets those may be AMS or maybe something else. The tattoo has dispersed over time and is now not clearly visible. This tattoo is again covered under his new inks. Meaning: Ray has tattooed his right shoulder by Tattooist, Sailor. The tattoo is in the shape of numeral ‘2’ with the Unicorn horn on its top. Meaning: Ray has inked a floral design on his left wrist by the Tattooist, Sailor. This tattoo is one of his eight embarrassing tattoos which is now covered under his newer ones. 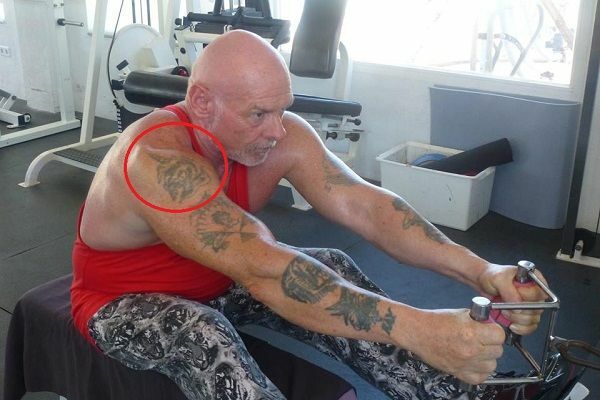 Meaning: Ray had started this tattoo mission when he turned 59. 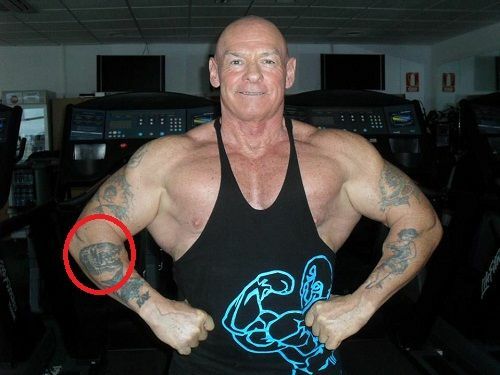 After getting into bodybuilding, Houghton was too embarrassed to show off his muscles with those prior eight tattoos, so he covered them with the Maori design art. From here he began his journey to cover up his skin and to reduce the signs of aging. 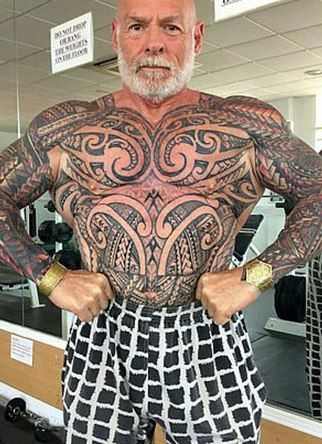 He visited a tattoo artist, Toby Dean to get his sleeves done and to cover up the older tattoos but ended up with the full body inking with the Maori artwork. He endured 14 months of eight to nine-hour session every two weeks, starting from his arms and legs. And over just 14 months he covered his whole body in a Black Bodysuit leaving just his feet, hands and face. Ray also has tattooed the back of his head with this artwork. In an Interview, Ray has said that.” The favorite part is his Buttocks where the Tattooist, Toby Dean has signed his artwork.